Blaine WA, United States - April 17, 2019 /MarketersMedia/ — Confused and torn lately with the idea of switching and ditching a traditional wallet for a minimalist one? Well, most people are aware that “habits” can be quite difficult to break. If you're still using the same wallet you got when you were in the 7th Grade, perhaps it’s the perfect time to invest in something a little more appropriate. 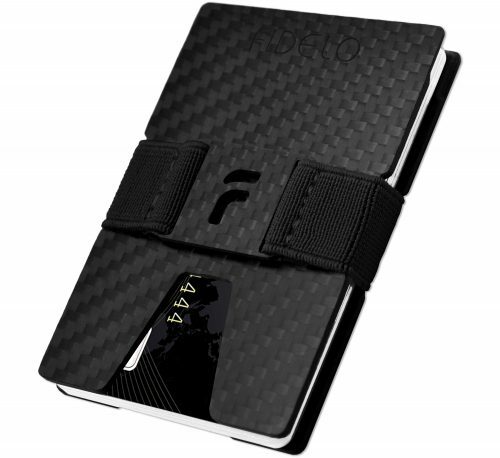 Anyone interested in trying out the carbon fiber PRESTIGE minimalist wallet should visit Amazon.com. Available while supplies last. Carrying a big bulky wallet can affect your back which may cause problems like Sciatica. Sitting for long periods of time on an inclined surface can take a serious toll on the spine and hips. Sitting on a big bulky wallet also puts pressure on the muscles and nerves in the back. Specifically on the lower back which affects various muscles including the legs and buttocks. FIDELO’s "Prestige" Minimalist Wallet is ergonomically designed to be thin, strong & minimal. It fits in any pant, trouser, short, jacket or shirt pocket and is built to last! It has also been designed specifically to reduce bulk while still carrying up to 15 cards. Ever struggled to quickly find that one credit card in an overstuffed bifold wallet? The Prestige Minimalist Wallet was designed to be small, thin, and lightweight yet expandable, and versatile. Making it easy to find the right card wihtout difficulty. Theft (whether pickpocketing or digital skimming), There might be a threat of losing one's money, credit cards and personal identity. The Prestige credit card holder can be carried safely in a front pocket. Unlike traditional wallets kept in the back pocket that are easy to see, the Prestige wallet is out of sight and can be kept discreetly in almost any pocket. With the introduction of minimalist wallets, worrying about a big bulky wallet sticking out of pockets or wearing through them can a thing of the past. Choosing the right minimalist wallet can be tricky. Aesthetics, convenience, and comfort are very important traits to consider for any item that is going to be used regularly. Great craftsmanship, attractive looking product. Unlike the majority of products I researched it has fairly thin plates, at about 2mm, which I find to be a positive. There are 3 extra replacement bands that come in different colors. The entire package gives the feeling the maker cares about quality. I love the sturdy, simplistic design of this wallet. I've got eleven cards and some cash and I know I could fit more if I really wanted to. Would recommend.